Karen Allen was born in Cape Town, South Africa, living under the shadow of the beautiful Table Mountain. She and her family left for Australia in the late 1970s. She can still distinctly remember as a child, driving home from the Melbourne airport, thinking how di erent the colour and the light was in this new at land her father had brought them to. Growing up, Karen always and only wanted to be an artist ... there was a icker of being a veterinarian but only a icker. She studied multidisciplinary ne arts at university and after graduating, worked as a commission-based artist for over a decade. When children came along, life took over and she stopped painting for seven years. Karen has worked in a variety of jobs, ranging from teaching to aged care. Just after turning forty, she looked at her life (which was lovely, by the way) and said, ‘What happened to that girl who always and only wanted to be an artist?’ She decided to devote herself back to her art, and has never looked back. Karen has always loved animals, but being in the presence of children she was reengaged with them and spent many a day at the Melbourne Zoo. One day she started drawing portraits of animals, experimenting with patterns as a background. In a spur of the moment she decided to put the pattern inside the animal, just to see. This started an obsession with patterning and sparked an idea for a book. 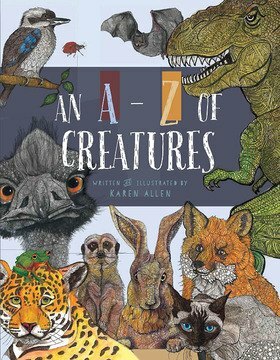 All Karen’s illustrations are drawn by hand, using ne liners and watercolours. Karen lives in Bayside, Melbourne and does sometimes think she lives in a zoo — with four children, a husband and a Labrador named Buddy.